Heriot’s coach Phil Smith has urged his men to build on last week’s outstanding victory at Melrose as they bid for another five league points in tomorrow’s Tennent’s Premiership clash with Boroughmuir at Goldenacre tomorrow (2pm). Bonus-point victories in each of the remaining two fixtures could be enough to secure a home play-off and Smith wants to tighten up on some aspects as Heriot’s target twin successes. “Despite the win at the Greenyards the players recognise there are still a couple of areas we need to be better at and for longer periods,” said Smith, who names John Rae and Scott King on the wings in place of the unavailable Rory McMichael and Craig Robertson. Meanwhile, injuries to Dale Robertson, Callum Aitkinson, Rory Drummond and Willie Wardlaw have forced Muir coach Peter Wright into changes. While there is nothing at stake for the visitors apart from pride, they will be going all out to finish the campaign with two wins. Edinburgh Accies will survive in the top flight subject to ratification in March of the recommendation in a review of the club game that there should be no relegation. However, Accies still want to move away from the foot of the table and they can do so by winning their remaining fixtures. “We can now go out and enjoy the last two games free from the burden of the permutations of chasing elusive league points,” said relieved Accies coach Derek O’Riordan. 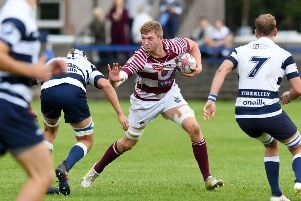 The first of those matches pits the Raeburn Place men against visiting Watsonians, whose coach Steve Lawrie looks set for a move to Edinburgh Rugby. Both the Myreside club, who still have an outside chance of reaching the play-offs, and Scottish Rugby, have confirmed that Lawrie has been in discussions with a view to replacing Roddy Grant who is bound for Ulster.